Cycling in classic bikes has become a true passion for many cyclists. Possibly the first big event on classic bikes was the italian Eroica. As time passed by, the Eroica became the “Strade Bianche” which now, by the way, is a prestigious professional spring classic. There are some rules which have to be obeyed in the classic bikes events. Bike has to be built before 1987, shifting with levers in the frame, no clip in pedals (strap pedals). Of course nothing about disc breaks and electronic shifting!! Another nice thing about this events is that you have to be dressed with old cycling clothes. Of course not a helmet (cycling caps are welcome!). Many participants wear old wool jerseys and some of them have a tire around the chest, like in the old cycling times. As said before, these events are becoming more and more popular. Also in Barcelona. 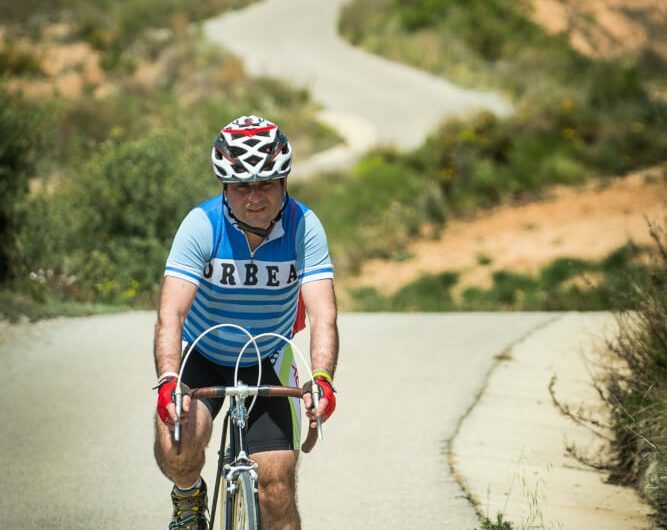 The most popular ride on classic bikes is “La Pedals de clip”, which takes place in Sant Martí Sarroca, in the Penedes wine region south Barcelona. This year 2019 the date is May 5th and you have 2 routes, 80 and 47 km long. And remember, this is not about being fast, this is about showing off your nice old bike and wear the old cycling clothes you kept hidden in your wardrobe!